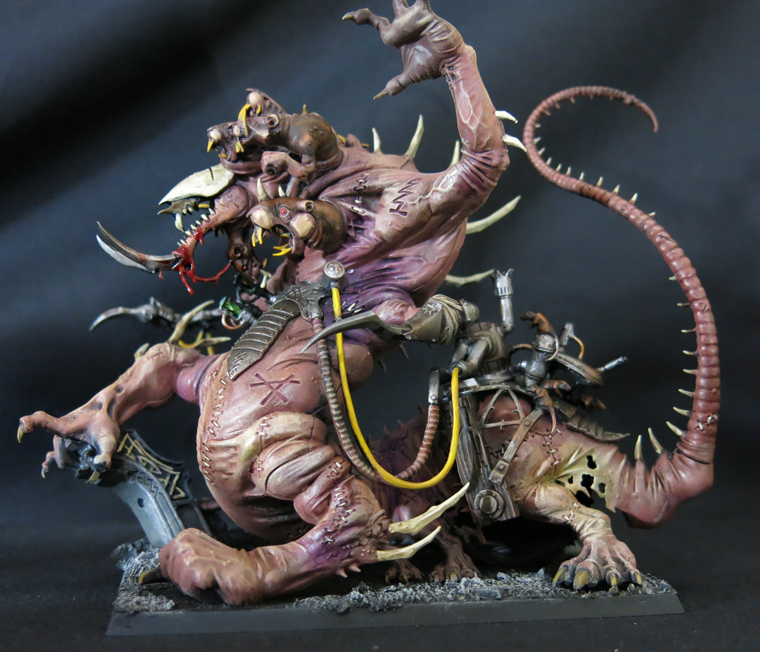 One of my big plans for 2019 is to deal with my remaining unpainted Skaven this year (GW’s hints regarding forthcoming models notwithstanding). 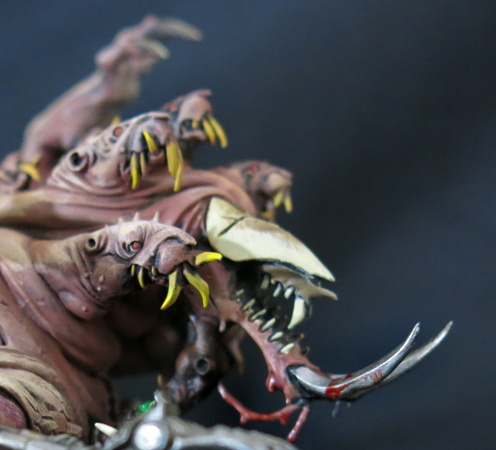 Starting as I mean to go on therefore I decided to tackle something ambitious this month and paint up what is probably my favourite model in the entire range – the Hellpit Abomination. 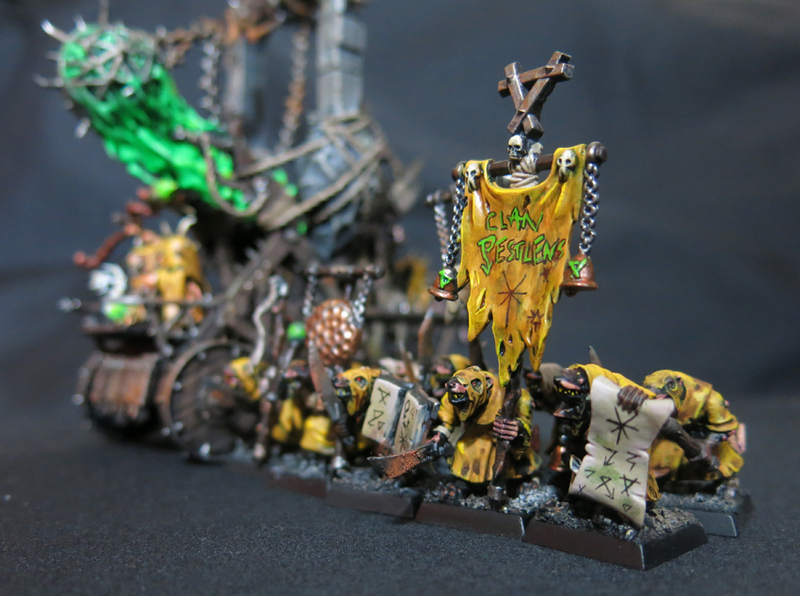 You can read the full story in plenty of other places so I won’t risk boring regular readers by raking over it all again but in brief, for those who’re new to the project, I’ve been a long-standing fan of the Skaven and collected a large number of them but until recently never got around to painting them. Realising that the enormity of the task was what was holding me back I decided to set myself a goal that was both consistent and manageable, to add a minimum of one model to the army every month. That could be anything from a Clanrat to a Screaming Bell, and of course I could always do more than that if I chose to. Models didn’t have to be painted start-to-finish in the month or anything fancy like that, so long as I had at least one new completed model by the end of the month I considered my goal met. So far I’m proud to say I haven’t missed a month, although there have been a few close calls. I only planned to do it for one year (2017) but it was such a success that I kept it up for a second and now a third. By the latter part of last year it was looking likely that the project would be complete by the end of 2018 but then I spotted a few bargains, fell behind on a few projects and the unpainted pile began to grow once again. 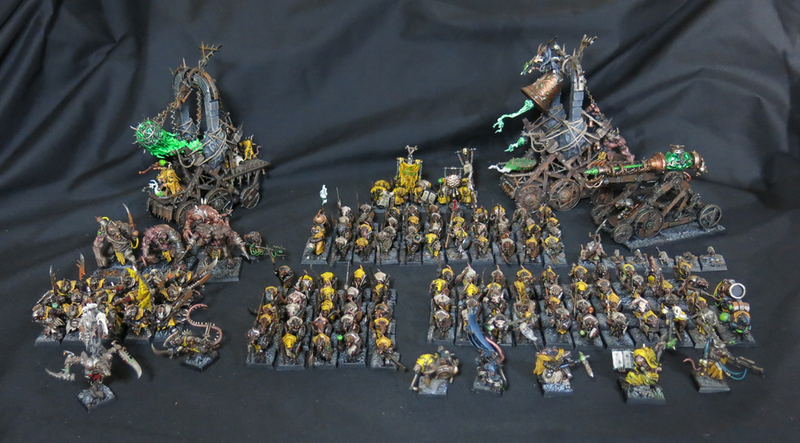 My ambition therefore is not only to continue my “model-a-month-minimum” challenge throughout 2019 but to have every last rat that I currently own completed by the time the bells toll to welcome us into 2020. I still need to dig through a few boxes and tally up exactly how many Stormvermin I own but by my approximate estimate has the number of models remaining in the low thirties – certainly well within the bounds of what I know I can achieve. Turning to this month’s output and although I’ve only finished one model I’m proud to say it’s an impressively ugly centrepiece monster. The whole thing is wonderfully disgusting, a mish-mash of body horror which manages to look chaotically stitched together yet still (roughly) coherent. Here we have the Skaven at their most cruel and crazed, cobbling together living flesh without the slightest concern for the unfortunate experimental subjects. 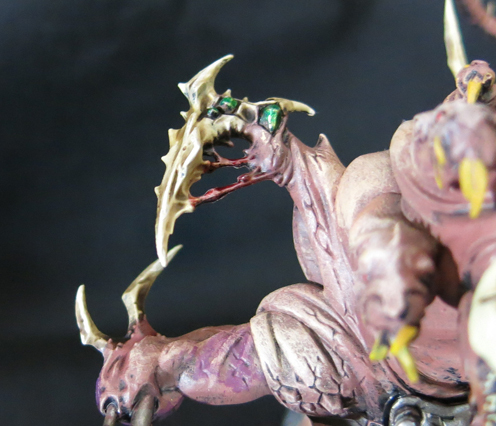 Despite being such a big model he proved to be relatively straightforward to paint – all that distressed flesh being a great opportunity to mess around with washes whilst all the textures and details were a great opportunity to let loose and have fun. The main difficulty I discovered was that he doesn’t lend himself to subassemblies but the fully assembled model has lots of challenging corners that are particularly tricky to get a brush into. Despite the irritation that caused I’d still happily paint another, were the opportunity to arise. I’m not entirely sure what I’ll tackle in February but there are a few contenders so I’ll take a rummage through the pile and see what I can come up with. Can it really have been two years since I returned to my Skaven army and committed to adding at least one model to it every month? 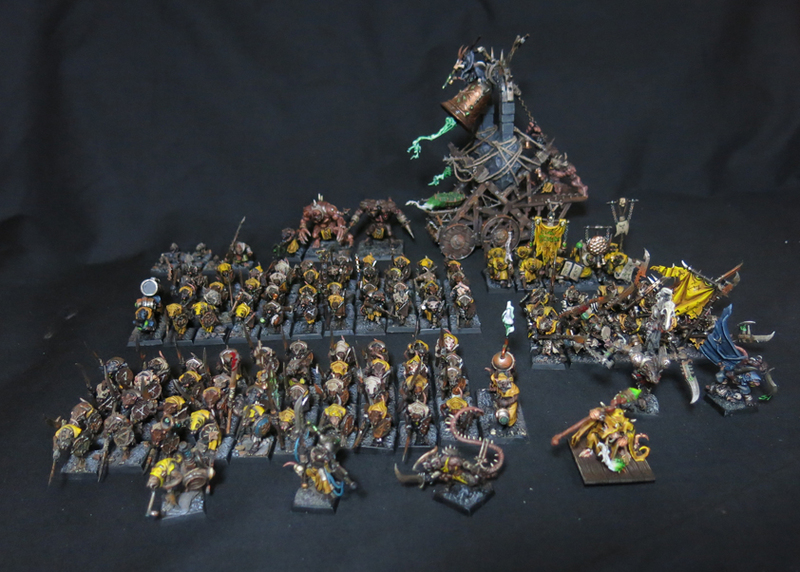 How my rat army has grown in that time! 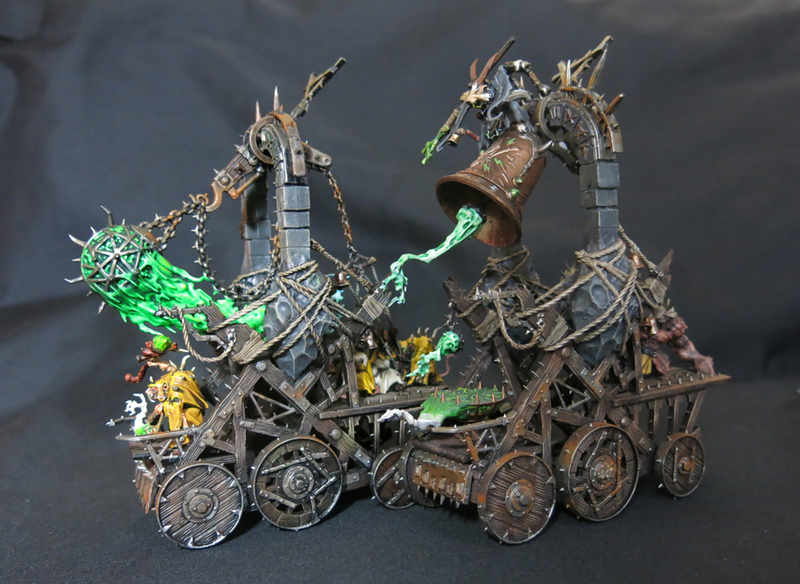 This past year has been nicely productive, with the collection reinforced by mighty war machines such as the screaming bell, the plague furnace and the warp lightning cannon, alongside dubious “heroes” such as Lord Skrolk. 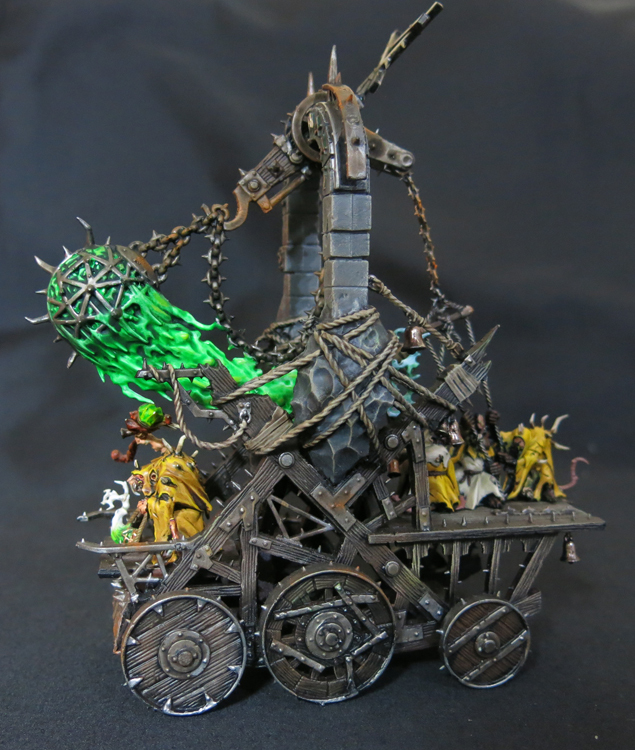 For those who are just encountering this project now; I realised back at the tail end of 2016 that my long dreamed of Skaven army was gathering dust in unpainted shame and might well continue to do so forever. My solution was to challenge myself to add at least one completed model to the force every month in 2017. So successful was this that I repeated the trick this year and indeed I’m aiming to do the same thing in 2019. Had I not given in to temptation I would probably have finished that original army by now but alas the lure of new models grew too strong and, combined with finding a few unexpected bargains, the heap of models to paint has grown a little over the past few months. Before we take a look at the whole force however it’s time for this month’s recruits. I’ve been chipping away at batch painting another unit of clanrats over the last couple of months and now at last they’re all finished. Batch painting really isn’t my strong suit, indeed it’s the polar opposite to the way I’m usually inclined to paint, but having had such success with my Night Goblins a couple of months ago I decided to apply the same technique to the clan rats. In tackling all these I was greatly assisted by the advice of The Actual Colin who wrote a very useful piece on how to tackle batch painting, and which I’d very much recommend to anyone who had a lot of troops they need to deal with. It’s strange to think that with these models completed I may have painted my last clanrats (unless of course I buy some more, which is always possible). 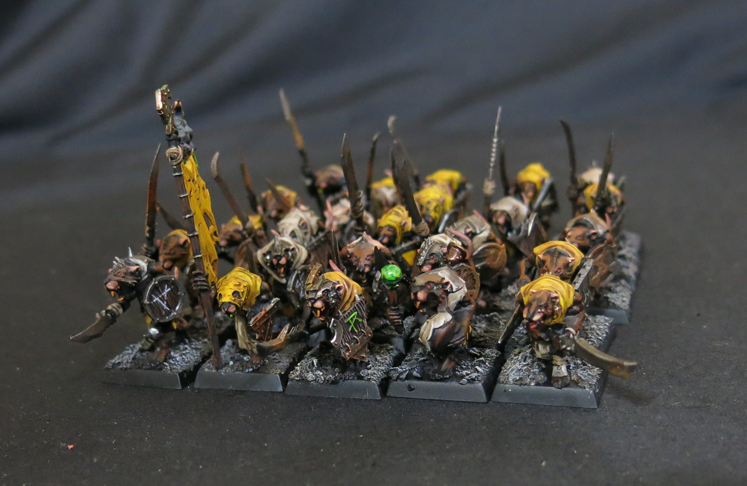 I’ve been painting them on and off since the kit was first released over a decade ago and can now boast a hoard of over one hundred of the little vermin. Of course whilst I’ve been keen to get them finished off so I can concentrate on some of the other additions to the army I’ll definitely miss working on them, there’s something comfortably familiar about painting them so who knows, they often turn up cheap on eBay so perhaps I’ll find myself led into temptation by nostalgia. For now however I’m calling this little lot done which of course means a group shot is in order. 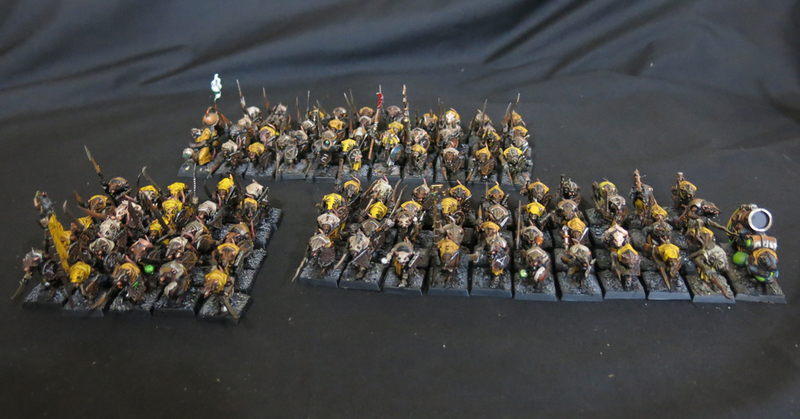 …And here’s the full verminous horde, one hundred and five clanrats (plus weapon teams) pouring forth from their warrens! However that is not all. Inspired by fellow blogger Azazel’s latest monthly challenge Dauntless-Diabolical-December, which called for participants to paint heroes or villains (alongside a wide range of other possibilities), I also decided to paint up this warlord. I’m not sure exactly where he originated from, he came to me with a large number of other models which I received from a friend, but I thought he would make a fine scheming and untrustworthy lieutenant for the army’s as yet unpainted commander. With these latest additions in place this is also a fine opportunity to look back at the way in which the army has grown over the past couple of years. Here’s how it all began when I committed to growing the army properly at the beginning of 2017. And here it is by the end of 2017. They say that no army is ever truly finished, a maxim I’ve always held to, but my ambition is to have the unpainted pile (as it stands currently) completely defeated before the end of 2019. 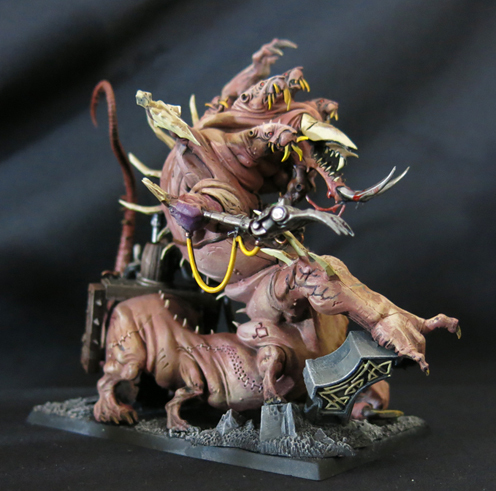 Of course that may go out of the window if GW decides to bless us with more Skaven models in the next 12 months (and before you accuse me of wishful thinking – have I not been harping on about the need for new squigs lately?). 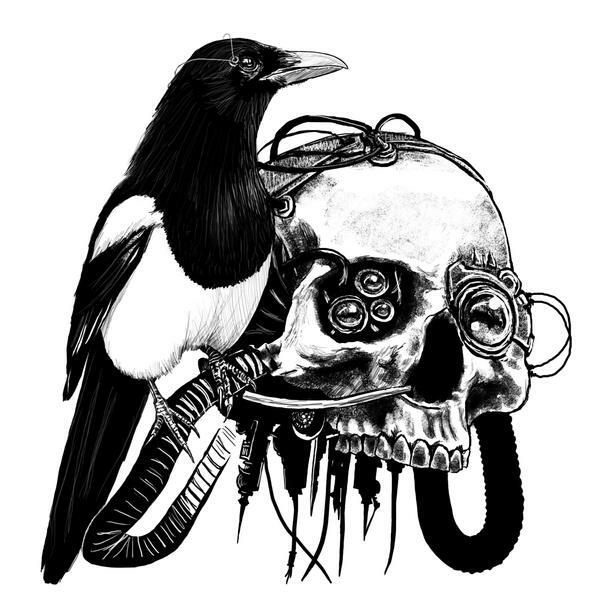 There’s no rest for the wicked, or the verminous, quite yet. 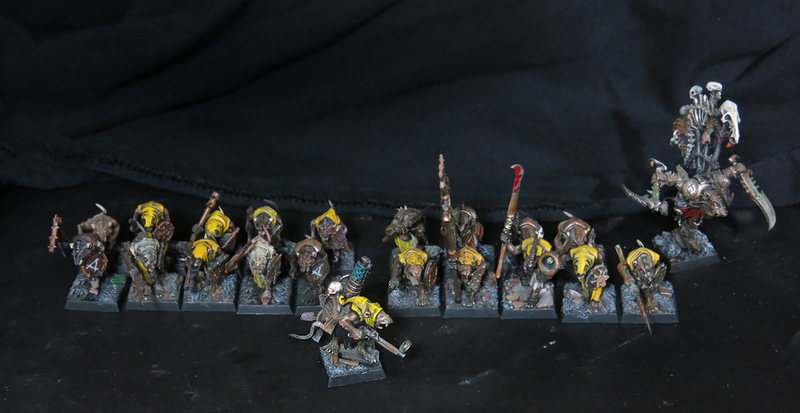 Time once more to look at the progress of my Skaven army this month. 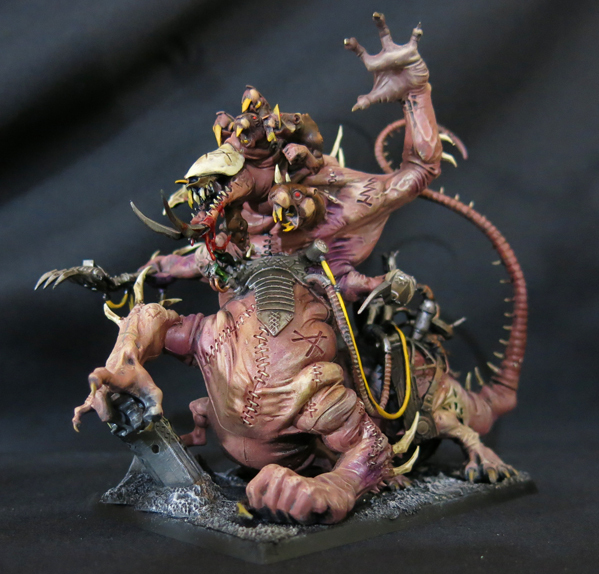 To recap once again for anyone new to this blog, I set myself the challenge of adding, at minimum, one completed model to my Skaven army every month in 2017. So successful was this at transforming the grey unpainted mass into finished models that I decided to repeat it in 2018. 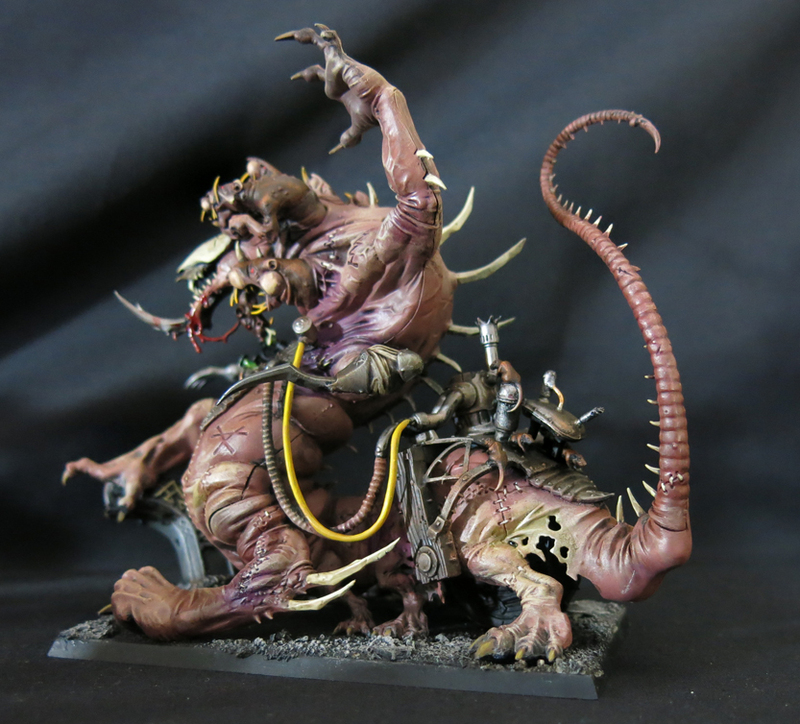 This month’s output however also counts towards Azazel’s September challenge – to complete a long neglected model – as it’s been crawling across my painting desk since way back in May of last year when this plague priest first put in an appearance. Close observers may have noticed that I based him on the little platform that he uses when riding on the plague furnace. An old-fashioned square Warhammer base is hidden underneath allowing him to be fielded separately from his vehicle. It really is past time however for that vehicle to be finished. 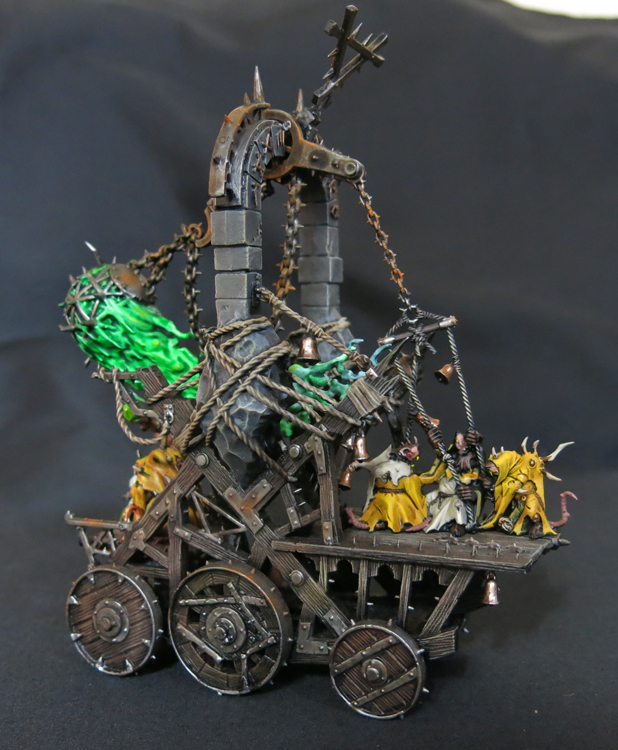 Last month I painted up the monks which pull the brazier so all I had to do this month was concentrate on the rest of the ramshackle structure. For a while there I worried I might not make it, having spent a lot of the earlier part of the month batch painting greenskins. However a last-minute flurry of activity, accompanied by shoving gobbos onto the back burner (something any Skaven would approve of!) saw it completed. The green smoke was surprisingly easy, being built up from a combination of Hexwraith Flame and Nihilakh Oxide over a white undercoat. And now you see why I had to paint those horrible plague monks just to push him into battle! The main thing is, now he can twitch his tail with pride even next to that show-off Grey Seer and his swanky bell. Right, now to see if I can’t get a few more gobbos done before the end of the month. I’m running an underground arms-race here after all! 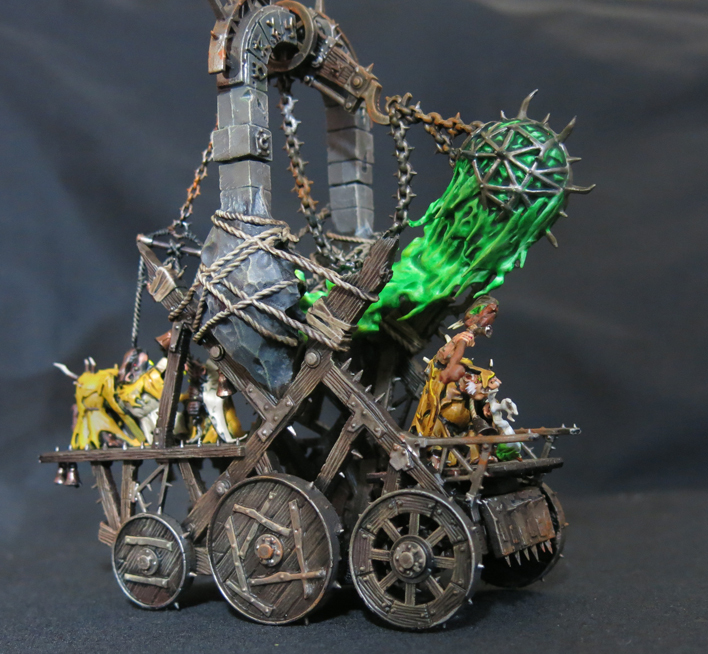 Another month has been and gone so it’s time to take a look at the latest progress on my Skaven army. First up a hulking brute sewn together in the labs of Clan Moulder; it’s another rat ogre. Having already got two ugly old rat ogres painted previously this time I tackled one of the far better looking beasts from the Island of Blood boxset. The two ugly old rats are joined by their rather more handsome new brother. Alongside the big bruiser I also started work on the third squad of clanrats, adding a second squad of spearmen to the army. Here’s the first of the newcomers. I might even have got a few more painted but I took a little more time instead to work on the unit’s banner. 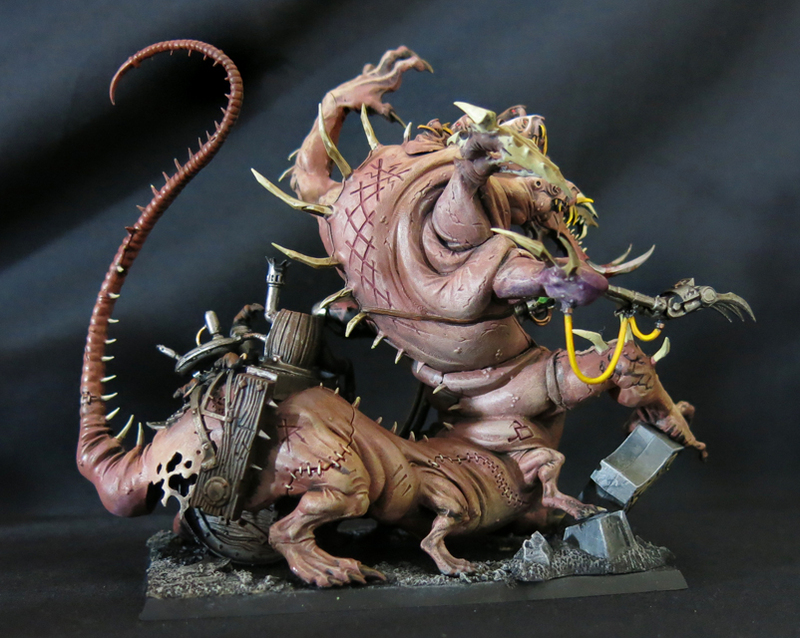 Having painted it as a sub-assembly I realised at the last moment that I didn’t have a rat to go with it and galloped through painting this scabrous rodent in time to include the finished article in this post. 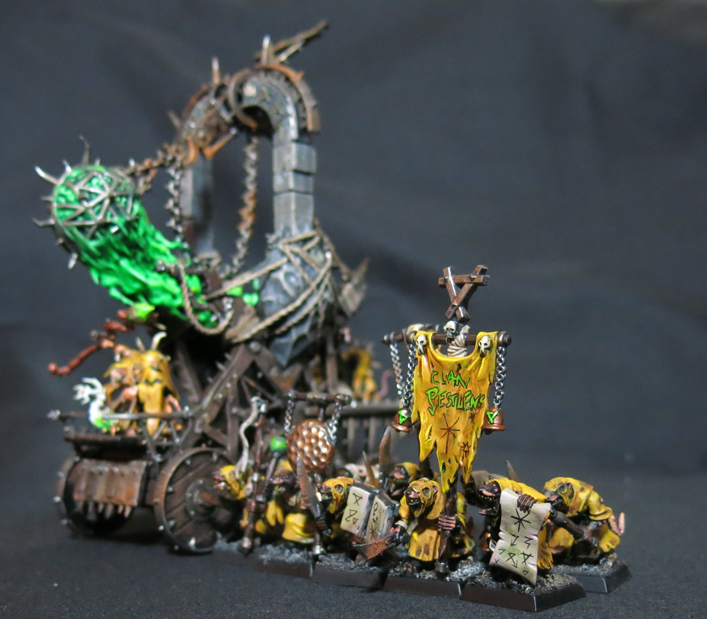 Inspired by the banners in Andy Chamber’s famous Skaven army (you know the one, White Dwarf 137 if you don’t) I thought about writing “Gaze Into The Eye Of The Warp And Despair” on the banner but bottled out in the end and stuck with just the rune of the Grey Seers, plus various Skaven squiggles. Finally, in spite of all my grousing about plague monks and swearing that I would never paint another I’ve done exactly that. That said these are a little nicer than their brothers in the rank and file. I know I’m becoming something of a stuck record on the subject but we can only dream that someday GW get around to releasing a kit for the normal monks of similar quality. Naturally these monks are not intended to stand alone but will be part of something much bigger. That, however, will have to wait but I’ll see what I can manage by this time next month.